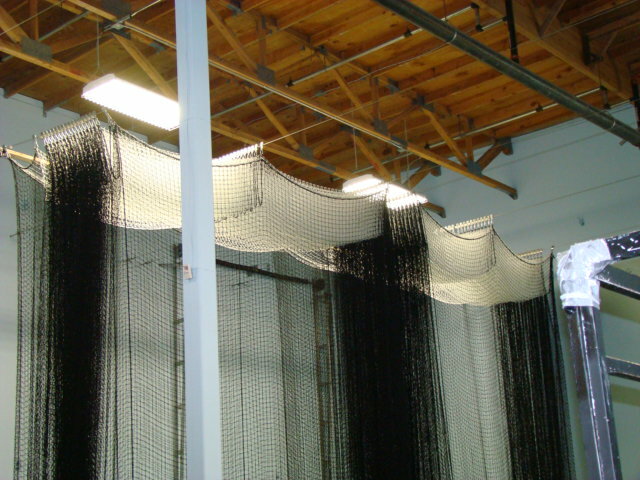 The Illuminator Batting Cage was designed with a white top which provides for a brighter hitting environment, making it ideal for indoor facilities. Built with high-quality industrial strength nylon treated to be water and UV resistant, this cage can also endure hard, outdoor use. The rope borders on all sides, top and bottom simplify installation and create a strong cage that helps to contain impacts and prevent ricochets from endangering athletes. The Illuminator Batting Cage is also an ideal place to practice pitching, kicking for soccer or football and various other drills that require an enclosed practice area. This training cage has been installed at major league training facilities and colleges and is now available to help athletes at all levels of competition achieve their potential. This is the batting cage of choice for indoor use. The Illuminator Batting Cage comes with only the netting. You will need to build a frame or install the netting into an existing structure. Each batting cage comes in a variety of materials selected for different uses. This cage is constructed with #42 Nylon.